He instituted a policy that five students in every rabbinic class of Yeshiva University were obliged to volunteer as chaplains in the US armed forces. These five were selected through a lottery system, and I happened to be one of them. I passed the physical and was informed that a chaplain was needed in the US Air Force, so this is where I prepared to go. However, my father objected. He felt, as did many Torah observant people back then, that the armed forces – with their secular environment – were not a place for religious boys. 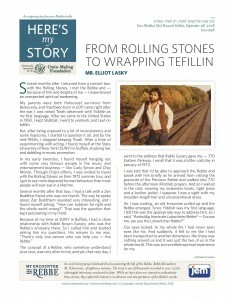 Several months after I returned from a concert tour with the Rolling Stones, I met the Rebbe and – because of him and despite of me – I experienced an unexpected spiritual awakening. My parents were both Holocaust survivors from Belorussia, and I had been born in a DP camp right after the war. I was raised Torah observant with Yiddish as my first language. After we came to the United States in 1950, I kept Shabbat, I went to yeshivah, and I put on tefillin. 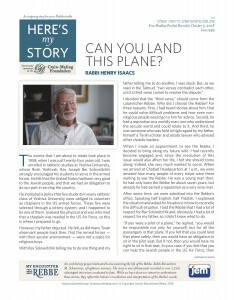 But, after being exposed to a lot of inconsistency and some hypocrisy, I started to question it all, and by the mid-1960s, I stopped keeping Torah. After a time of experimenting with acting, I found myself at the State University of New York (SUNY) in Buffalo, studying law and dabbling in music promotion. I was born in Siedlce, Poland, four years before World War Two broke out, at which time my family fled to Russia. 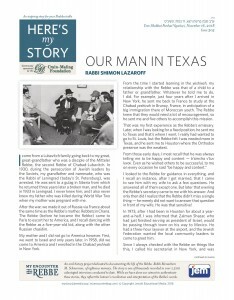 Despite the difficulties of living on the run, my father spared no effort to educate me and my siblings in the ways of Judaism – in keeping with the education he, himself, had received at Chabad’s Tomchei Temimim yeshivah in Warsaw. After the war, we came to Israel, where I learned in the Chabad yeshivas in Tel Aviv and in Lod. After I got married in 1961, I began working as a teacher, eventually taking a job with the Tomchei Temimim yeshivah in Kfar Chabad, where I was placed in charge of the Chassidic development of the students. At one point in the mid-1970s, I had to deal with a really problematic group of students in the yeshivah. They were considered difficult to discipline, and the widespread opinion among the senior staff was that that they should be dealt with severely. I opposed this approach, insisting that they be dealt with more leniently. But I also had my doubts – perhaps I was being too soft, perhaps the other teachers were right and we should be more firm with them. A few months ago, JEM released a fascinating film: Faithful and Fortified, Volume I - The Inside Story of the Rebbe’s Involvement in Israel’s Security, As Told By Its Defense and Government Leaders. We are currently working on one of the next volumes, called Faithful and Fortified: Army Chaplains and Religious Leaders. It will feature interviews from Israel’s Rabbinical and religious leaders and their relationships to the Rebbe. Here is a short clip of the interview we did with Rabbi Mordechai Peron, the former Chief Rabbi of the IDF from 1971-1977. The interview took place at Rabbi Peron’s house and lasted close to four hours. It was shown at a Merkos Chanukah party. Help Us Find Israeli Security Interviewees! Pursuant to an original round of interviews which were featured in Faithful and Fortified Volume One (see trailer below), we will be conducting an additional 60 interviews with Israeli security, intelligence, journalists and government officials who had meetings and correspondence with the Rebbe about protecting Israel. These interviews are being made possible through an generous grant by Rabbi Yossel Gutnick, the Rebbe’s emissary for Shleimus Ha’aretz. 45 of the interviewees have already been identified and contacted, and 15 interview slots remain. If you have any tips or advice on specific individuals who should be interviewed for the continuation of this vital project, please email: ycagen@jemedia.org. Please include as much information as you can about the individual you are suggesting we interview and all about his interaction with the Rebbe, including sources or links wherever possible. Please explain why you feel it would be important to interview him or her. If possible, please include his or her contact information. Want to see more Faithful and Fortified? Click here. 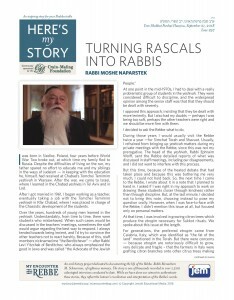 Welcome to the My Encounter with the Rebbe blog!